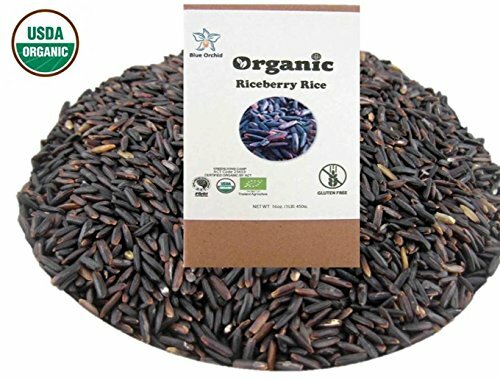 This premium organic "Riceberry" purple rice from Thailand, is one of the many rice varieties grown at our organic farm. It is a dark purple rice, signifying higher nutrients, whole grain, vitamins and other health benefits. It is the best quality Thai long grain black rice species. In addition, it is gluten-free, non- GMO and very scrumptious. It would also be a good idea to include a 'Riceberry', black/purple rice variety into your diet. You will enjoy the benefits of higher levels of vitamins, minerals, and antioxidants. For those of us who have to monitor our sugar intake, the Glycemic Index is significantly lower, which makes Riceberry one of your best rice choices. It is grown on an eco-friendly, family owned farm which has been 'Certified Organic' by several important government bodies, such as USDA Organic, Thailand FDA, Canada CFIA, and the European Union. In order to have these seals of approval, it must maintain strict standards with respect to organic food agricultural practices. Our mission is to promote Eco Living and Nature Conservation. We are proud to promote Riceberry Organic Rice because it is a natural health food and the people who grow it are working hard to preserve our environment. Get a natural food for your healthy life. It is a great gift for friends and family. We use vacuum packaging to give long shelf life. We also added a protective recycled brown box for safety. Ingredients : 100% organic Riceberry rice. Approximately 9 Servings per package. Expires 1 year after opening. After rinsing and draining the rice, add 1 cup of water with 1 cup of rice. Bring to boil, then turn heat down to simmer with the lid on and stir occasionally. Cook for 30 minutes or until the water is absorbed. Turn heat off and steam with the lid on for another 10 minutes. RICE BERRY RICE is a HEALTHY FOOD CHOICE. 100% Organic, Whole Grain Riceberry Rice imported from Thailand. Non-GMO. CERTIFIED ORGANIC. by USDA, Canada Organic, EU Organic, Thailand FDA, and IFOAM Organic Agriculture Thailand. NATURALLY GLUTEN FREE and NO ADDITIVES. Our organic purple rice is high in fiber and vitamins with nothing added. 1 Ingredient with 100% organic Riceberry rice. SUSTAINABLE AGRICULTURE and FAIR TRADE. We source our premium quality organic rice from small independent farmers that use agricultural techniques that protect the environment, public health, communities, and animal welfare. We also employ Fair Trade as one of our guiding principals to make sure the grower receives full market value for their efforts. Color: Black With a Purple Hew After Cooking. If you have any questions about this product by Blue Orchid, contact us by completing and submitting the form below. If you are looking for a specif part number, please include it with your message.